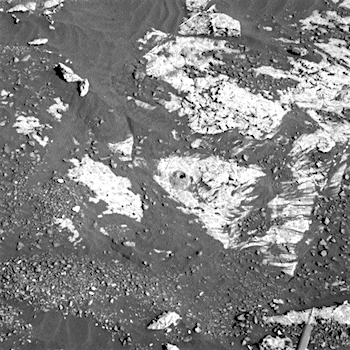 Sol 2225, November 9, 2018, update by MSL scientist Claire Newman: Tosol we received confirmation that Curiosity’s drill yestersol was successful, as shown in this Navcam image of the “Highfield” target – our eighteenth drill hole in the martian surface! This entry was posted in Reports and tagged Aeolis Mons, Curiosity, Gale Crater, Highfield, Jura, Mars Science Laboratory, Mount Sharp, MSL, Murray Formation, NASA, Vera Rubin Ridge. Bookmark the permalink.